EASTABOGA, AL – Tim Busha of Boaz, AL drove the Kilpatrick Racing GRT to his second Chevrolet Performance Super Late Model Series win of the season on Saturday night and picked up a $6,000 check in the Dega 100 at Talladega Short Track. 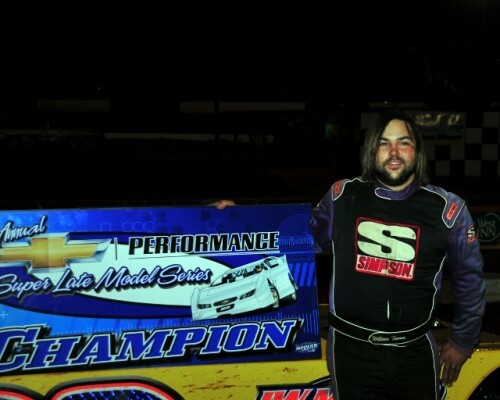 William Thomas of Phenix City, AL finished seventh and won the $10,000 2013 Chevy Super Series Championship. Busha led the first 56 laps of the race, survived a mid-race side-by-side battle with National Dirt Late Model Hall of Fame Inductee Ronnie Johnson of Chattanooga, TN, and then took the lead for good on lap 62 to take a 4.336 second margin of victory over Adam Martin of Talladega, AL in the Seals Insurance Special. Ross Martin of Talladega, AL finished third in the Blake Dorsett Trucking GRT and Brad Hall of Knoxville, TN took the fourth spot in the Pilot Travel Centers Warrior. David Earl Gentry of Murfreesboro, TN drove the Eads Farms/Hardy & Associates Warrior to a fifth-place finish, and Brent Barrett of Cleveland, TN was sixth in the Custom Spraying, Inc. GRT. Thomas finished seventh in the Alexander’s Industrial Service GRT, and Johnson dropped back to finish eighth in the Tommy Pope Construction Warrior. Matthew Turner of Dawsonville, GA took the ninth spot in the J.T. Kerr Racing Equipment Special, and David Brannon of Elora, TN rounded out the top ten in the Elora Gin Company Special. Busha made the Dega 100 a clean-sweep, as the out-timed the 24-car field with a lap around the 1/4-mile clay oval in 13.390 seconds to earn the pole position for the big show. The two ten lap B-Main races were won by Mark Tice of Avon, MS in the Precision Marine Special and Gentry. When the first 100-lap super late model race at Talladega Short Track in over 19 years took the green flag, Busha took the lead followed by outside from row starter Ted Lackey of Munford, AL, Barrett and Johnson. On lap five, Johnson got by Barrett for the third spot. Johnson then chased down Lackey to challenge for second, and took the position on lap 12. The first of six caution flags came out on lap 20 when Rusty Schlenk of McClure, OH cut down a left-front tire. Busha had Johnson and Lackey doubled up behind him for the “Dixie Style” double-file restart. When the field went green, Adam Martin raced his way through the pack from his tenth starting spot and into the top three. Dustin Stutts of Lorretto, TN spun the Dowdy Welding and Fabrication Special to bring out the second caution flag on lap 25. Busha led the doubled up cars of Johnson and Adam Martin down for the restart. Martin challenged Johnson for second when the green flag came back out, and passed the Chattanooga Flash for the spot on lap 26. The third caution flag gave way for the red flag on lap 27 when Carlton Freeman of Eastaboga, AL spun the Freeman Racing GRT and collected Steve “Captain” Kirk of Munford, AL in the Advance Lazer and Machine Special, Stutts, and Maddox Mullinax of Birmingham, AL in the CRM Motors Special which blocked the track. Busha, Adam Martin, Johnson, Lackey and Barrett made up the top five for the restart. When the green was displayed for the restart, Johnson turned up the wick, challenged Adam Martin for second, and took the spot on lap 28. Adam Martin was able to reload by lap 36 and took another shot at Johnson to retake the second position. The caution bulb was lit up for the fifth time on lap 39 when Stutts had a broken left front suspension. Busha remained on the point for the restart, but the Adam Martin-Ronnie Johnson Show for the second spot was ready for its next act. Adam Martin passed Johnson for second on lap 41. Lackey dropped out of the fourth spot on lap 54 and went to the pits just as the lapped car of Mark Tice of Avon, MS spun the Precision Marine Special and collected Adam Martin. Tice was ticketed for the caution and Martin got back the second between Busha and Johnson. Johnson was the man on a mission when the green light was refired. Johnson sailed by Adam Martin for second on lap 55 and then set his sights on Busha. After leading the first 56 laps of the race, Johnson took the lead on lap 57. Johnson didn’t have a chance to pull away, as the caution flag came out on lap 58 when Josh Adkins of Talladega, AL spun the Yellow Hammer Construction Special in turn three and collected Mark Dowdy of Waterloo, AL in the Action Track Chair Special. Johnson led Busha, Adam Martin, Barrett, and Hall doubled up behind him for the restart. Racing side-by-side, Busha came back to lead lap 60, but Johnson came back on the outside to lead the 61st lap. Busha wasn’t ready to surrender, as he drove under Johnson in turn two to take the lead for good on lap 62. and then began to check out on the field. 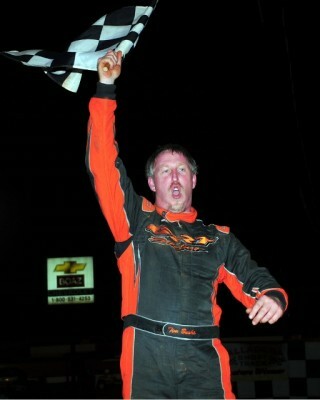 Johnson had his hands full, as jumped the cushion in turn two when Busha took the lead on lap 62, and bushed the wall. That must have affected the handling of Johnson’s race car, as it was the last time he would see the front of the field for the remainder of the race. Adam Martin showed his number 47m to Johnson once again on lap 63 when he grabbed the second spot. On lap 66, there was a new top five contender to challenge Adam Martin, as his dear old dad Ross Martin of Talladega, AL climbed up to the fifth spot. By lap 80, Ross Martin drove by Johnson and Barrett and into the third spot. But nobody had anything for Busha in the final caution-free 39 laps of the race, and he took the checkered flag with a 4.336 second advantage over the Martin boys, son Adam and papa Ross. The Dega 100 was completed in 61 minutes and 5.509 seconds. Thomas ended the 2013 Chevrolet Performance Super Late Model Series season on top of the point standings with 674 points after four wins, two third-place finishes, and one seventh in seven starts. Thomas will pick up a $10,000 check for winning the first Chevrolet Performance Super Late Model Series National Championship. The victory in the Dega 100 vaulted Busha from fourth to second in the final 2013 Chevrolet Performance Super Late Model Series point standings. Both Busha and Johnson finished up with 628 points, but Busha won the tie-breaker with two wins to none for Johnson. Turner finished fourth in the standings with 622 points, and Barrett finished fifth in the points chase with 604 points. Adam Martin finished sixth in the Chevrolet Performance Super Late Model Series standings with 588 points, and seventh went to Chase Edge of Lafayette, AL with 536 points driving the Edge’s Gas Company Special. Ross Martin finished eighth with 520 points, Brannon is ninth with 512 points, and Brad Smith of Winston-Salem, NC rounds out the top ten with 510 points driving the Velocita Special. 1ST B-MAIN: 1. Tice; 2. Adkins; 3. Thomas; 4. Mullinax; 5. Combs; 6. Kirk. 2ND B-MAIN: 1. Gentry; 2. Turner; 3. Wilson; 4. Freeman; 5. Schlenk; 6. Stutts; 7. Roszell; 8. Smith. Chevrolet Performance Parts is the Title Sponsor of the Chevrolet Performance Super Late Model Series. Hoosier Racing Tire is the Official Tire Sponsor of the Chevrolet Performance Super Late Model Series. Hedman Hedders is the Official Hedder of the Chevrolet Performance Super Late Model Series and the Hedman Husler Award sponsor. Bilstein Shocks is the Official Spec Shock of the Chevrolet Performance Super Late Model Series. Chevrolet Performance Super Late Model Series Contingency Sponsors for 2013 are Modern Images, Mike Custom Tanks, AR Bodies, Velocita Racewear, and KRC Power Steering.